CAT Application form start date is August 5, 2019. CAT Application Form 2019 Important Dates to remember are the CAT application form start date and CAT 2019 application form last date. Please note that with an increase of Rs.100/- in its application fee to Rs.2000/-, while the CAT 2019 Online Application process will begin on August 5, 2019, the CAT 2019 application form last date to fill up and submit the CAT Application form 2019 online is September 20, 2019. CAT application form fees is Rs.2000/- without which you will not be able to submit the CAT application form 2019. The CAT 2019 exam will be conducted by IIM Kozhikode on November 24, 2019. There is no change announced in the CAT 2019 exam pattern by the CAT convening IIM Kozhikode. Besides, the CAT exam duration also remains of three hours with 100 questions divided in three sections, as was the last year. CAT is the largest MBA entrance exam conducted every year by IIMs for MBA admission in 20 IIMs and other top MBA colleges of India. IIM Kozhikode will conduct CAT 2019 in two separate sessions. The Common Admission Test (CAT) CAT 2019 will have a combination of MCQs and Non-MCQs to provide level playing field to the students of all streams. September 20, 2019 at 11.59P.M. Immediately after CAT Advertisement is out in news papers on July 27, 2019, the CAT 2019 Application start and last date to apply are also announced by IIM Kozhikode. CAT application form 2019 will be available online only. The step by step process how to fill the CAT application form online, how to pay CAT application fee and ultimately how to submit CAT application form must be known before you begin to fill the CAT application form. CAT 2019 online registration form and CAT 2019 application form is a single document divided in 5 pages and as such cannot be separated. After entering the basic details as a new user registering for CAT 2019, you have to complete the CAT Application process. CAT 2019 online application process will remain open till 11.59 PM on September 20, 2019. CAT Application online form in the past also remained open for more than one and a half month. CAT 2019 Application form needs to be filled up cautiously as per the CAT Application guidelines as the application form mistakes in CAT may require you to apply again and your earlier CAT application fee may also not be adjusted. It should be noted that final submission of CAT application form must be done latest by the CAT 2019 Application form last date since IIMs do not provide any facility to submit the CAT form beyond the CAT application form 2019 dates. Please also note that no late charges are applied on CAT application form fees. So be careful, while completing the CAT application process. Please note that the CAT Application process is online only and there will be no offline CAT application form. There is no separate CAT Form 2019. The CAT 2019 application form is a part of CAT 2019 registration form. CAT online registration process will also have CAT application 2019 as a part of the complete CAT registration and application process. You will need to apply for CAT online and while completing your CAT 2019 form online CAT application 2019 form can be filled up. While filling up the online CAT 2019 application form, you should be clear in your mind which management programmes in 20 IIMs, you wish to opt for. The CAT application form asks you to fill in the details in the application form. In case of filling incorrect information in CAT 2019 application form not only the candidature of the aspirant will be treated as invalid but the CAT application fee will also be forfeited. CAT 2019 application process can be completed in 3 steps – CAT Registration, filling up the CAT application form and making payment of CAT application fee. Read the instructions and watch the video on CAT website before beginning to fill up the CAT application form. You can save and exit while filling up the CAT 2019 application form any number of times to edit and complete it later or can Save & Continue each section till you submit the application. If you do not pay the CAT 2019 application fee after completing your CAT 2019 application form, your CAT application will remain incomplete and you will not be allowed to appear in CAT 2019 exam. The 1st part of CAT online application form requires your basic details and is called the Registration form. You need not pay any fee for the basic CAT Registration. Immediately after login on IIM-CAT website with your basic details, IIMs will send you CAT Application ID and CAT password. With this unique CAT 2019 ID, you will login to CAT 2019 exam online application form which will have more pages to fill up and can be submitted only after making CAT application fee payment. 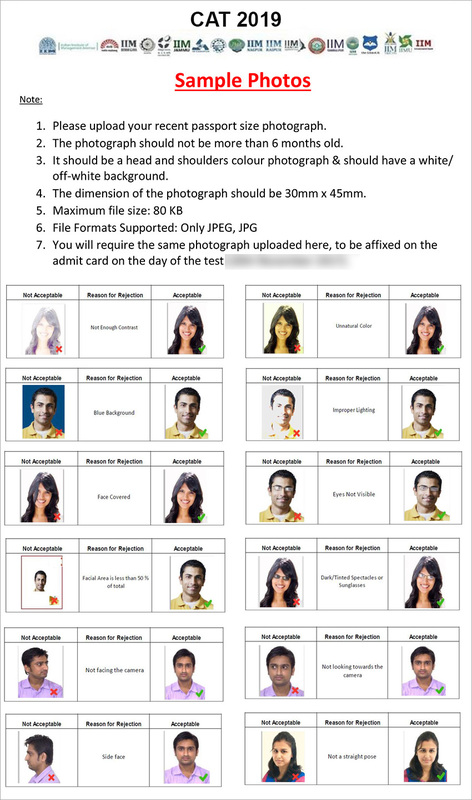 Scanned image of Passport size photo with the dimensions 35mm X 45mm along with the scanned image of your signature with the dimensions 1000mm X 35 mm. is required to be uploaded at the time of registration for CAT 2019. Please note that the documents file format should be .jpg or .jpeg and the file size should not be more than 80KB each. The image should be clear with a minimum resolution of 150px. CAT 2019 Application process: How to begin? Login on CAT website as new user on ‘Register now’ and enter the basic details. In a few minutes of submitting the brief Registration Form, you will receive an OTP. After verifying the same, you will get CAT user ID on the registered email & Password with the subject line CAT 2019 Login Details. Ensure to check your mailbox immediately and in case you don’t find it there also check the spam mail. The CAT Application process including payment of CAT application form fee has to be completed within CAT application 2019 dates. An important guideline for CAT application 2019 is to keep a watch on all the CAT application form 2019 important dates especially the CAT application form start date. Please follow the important CAT application guidelines while completing your CAT application process. Step-2: Academics- Insert all your academics beginning from class 10 onwards like exam taken, Board/University, marks obtained, maximum marks, percentage of marks among others in the required fileds of CAT application form. The details of professional degree, if any are to be entered on this page. Step-3: Work Experience- If you are a candidate with work experience, enter your experience in completed months as on 31st July 2019 in CAT application form. Check all the Industry Types applicable to you, with Work Experience in months for each Industry Type. Step-4: Programmes- This page of CAT Application form requires you to select any number of Programme Names offered by 20 IIMs in this section. 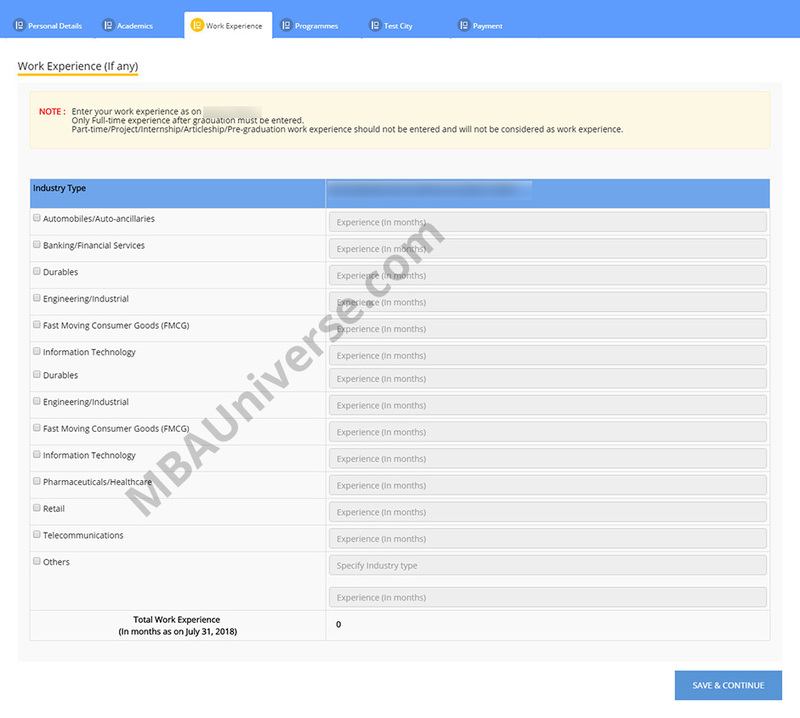 Select the IIM programme and then select the IIM Interview City for that programme as per the cities in the respective drop down list. For the 6 new IIMs you need to choose the same interview city. This page also wants you to select 4 preferred exam cities to appear in CAT 2019. However, you cannot select the same exam city twice in order of preference. Step-5-Test City: There are 147 test cities for CAT 2019. Candidates can choose 4 preferred test cities in order of preference to appear in CAT 2019. CAT 2019 Application process is simple and can be completed within the specified time although candidate can login again and again to complete the application. CAT application form will require you to fill up with your academic details, uploading of photograph, signature and requires category certificates as per the IIMs prescribed format for CAT application. The CAT 2019 online application form need not be completed in one go. 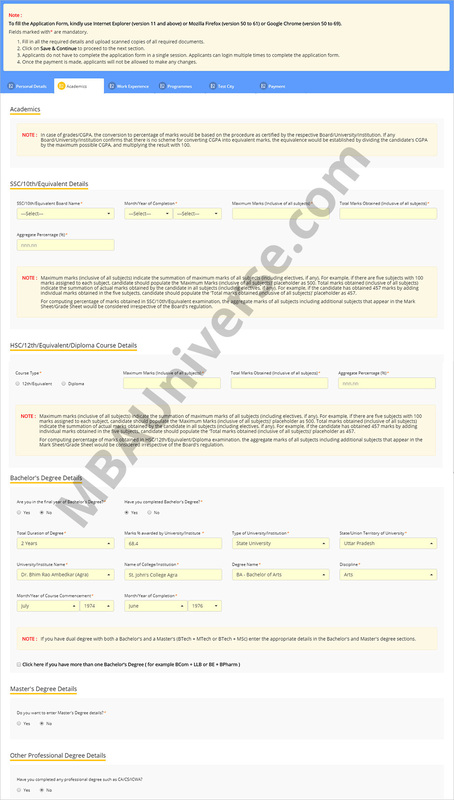 You can revisit the CAT application form several times and complete it in steps. You will not be allowed to continue your CAT 2019 application process, if mandatory information is not filled up. If you forget your password during the CAT online application process, you may click on the Forgot Password button on the Existing User login window. The new password will be sent in the email to you, and not as an SMS.